I'm fairly new to the blogging scene compared to some of you seasoned bloggers, and it takes some time to figure out the lingo. While working on a recent sewing project I relied a lot on sewing blogs, particularly sew-alongs. I have to admit I wasn't sure the real meaning of a sew-along except that you're documenting your sewing process. Then I'm thinking, well maybe I've been doing it all wrong! I'm sure there is no right or wrong answer, but I like the idea of a sew along being just that... Sewing along! I usually like to figure things out on my own, but sew-alongs actually help! 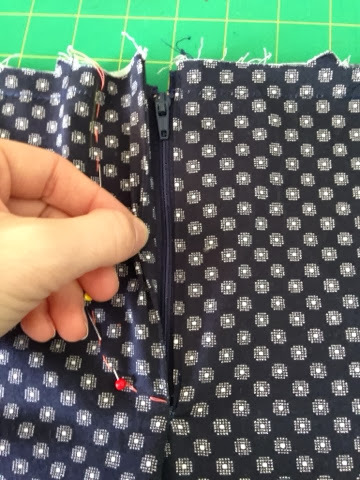 After reading a specific step in the pattern directions 10 times and still not getting it, I turned to sew-alongs (and reviews) for advice. Wow! What a help! It's amazing how real images and different wording can help. The other great thing about sew-alongs is that if you catch it while the sew-along is actually going on, you can sew with other people, ask questions, get advice and share your finished product. Of course not all patterns have a sew-along to match them (independent pattern companies are great at sew-alongs), but the ones that do can be so helpful! I thought it would be fun to try a sew-along with all of you! So I'm asking all of you to give me some ideas! What do you want to sew? Comment any pattern and I will pick five of those patterns. 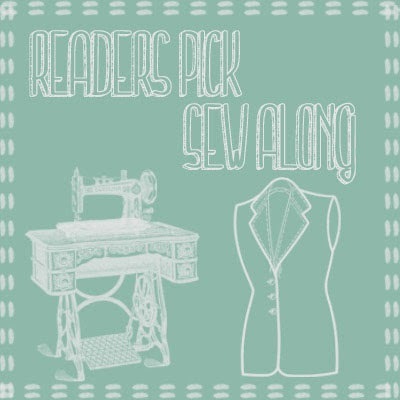 Then you, the reader, can vote on which one of the five you want to do a sew-along for. And on top of that, I will let YOU pick the fabric I use! My goal is to have the sew-along start at the end of March and run through the first two weeks of April. Of course timing will be determined based on what pattern you choose and how complicated it may be. A solid schedule will be provided once I see what pattern is chosen! Sound like fun? Start getting those pattern choices in and let's get it started! P.S. I'm going to be participating in the Mad Men Challenge by Julia Bobbin! Can't wait to give it a try! I have been thinking about doing the Mad Men Challenge too! Just need my fabrics! What is the Mad Men Challenge? Have not heard of it so how do I join? As a beginner I find the sew alongs very helpful even if I am referring to them at a later date. I love that there is more room for explanation on technique or fitting adjustments. A nice summer blouse would be great! The indie pattern companies do a lot of their own sew alongs - maybe something from the big 4 since their instructions are so cryptic? I've attempted 2 blouses with plackets that stop halfway down the shirt and they always look junky (if I don't give up...). - maybe some help there? Or something made out of ITY (just bought a bunch from you on sale!) - the appropriate negative ease needed on knits always throws me off. Thanks! I have a feeling that ideas are going to be all over the place... Nonetheless, allow me to submit a suggestion for Vogue1233 - a Pamella Roland dress. It looks like it could offer opportunity to explore some techniques, and it's definitely a pattern that benefits from a perfect fabric choice. I'm up for anything! New Look 6097, an easy knit dress for Spring because yes I'm obsessed with knits and I went a little crazy on your last knit sale. I would prefer any pattern from Vogue, Simplicity, McCalls, Butterick, or Burda. Those are always going on sale at JoAnn's. I'm just not at the point where I can see spending $20 on a pattern. any pattern but how about using the ultra suede that you recently had a great price on. How about an indie skirt or dress pattern, like the Gabriola skirt by Sewaholic or the popular Anna dress from By Hand London? Wow thank you for all the suggestions! Almost seems like you all are open to anything. Let me look up some of the patterns you are interested in and we will get started! !